MO 370 path visualization - this visualization is from an early feasibility study. The final design is likely to be quite different in width and other design details. Much of the difficulty and delay in the project has been over difficult design details on a project placed on an existing bridge with limited width and difficult structurual issues. This crossing is important not only because it creates another vitally important bicycle and pedestrian connection between the first and third most populous counties in Missouri, but also because it will provide an easternmost "capstone" connection to tie together a potential future completely integrated trail system on both sides of the Missouri River throughout St. Charles and St. Louis Counties that will also connect directly into both the Katy and the Rock Island Trail State Parks. In short, this is a vital connection for the local communities, the St. Louis region, for the state of Missouri as a whole, and because of the connections it facilitates to regional and national bicycle routes and trails. The MO 370 Bike/Ped project has been under planning since 2013 and funded for over a year. However, the project has encountered a series of technical difficulties that, quite frankly, seriously endanger its completion. We believe that if all participating agencies work together in good faith, that this vitally important project will move forward to a successful completion. It is for those reasons that Trailnet and the Federation wrote this joint letter of support. Please read on for details about why this project is so important. For nearly thirty years, Trailnet has brought together friends, organizations and people from many communities to create positive change in the St. Louis bi-state region. Trailnet works to improve the quality of life for our families, neighbors, and communities. Our work and our partnerships directly impact local citizens, schools, businesses, communities, and nonprofit agencies throughout our region. 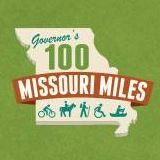 The Missouri Bicycle & Pedestrian Federation is a statewide organization working on behalf of the millions of Missourians who walk and bicycle regularly, with over 5000 direct members and 50,000 members of affiliated organizations across Missouri. We are currently in our 22nd year advocating for advancement of bicycle and pedestrian access, safety and education in Missouri. Trailnet and the Missouri Bicycle and Pedestrian Federation are writing you today out of our joint concern about the importance of the Discovery Bridge nonmotorized transportation project. We want to be clear that we prefer at least an eight foot nonmotorized path on these types of facilities and recognize that the best facilities follow best practices meeting ADA requirements and explicitly give people walking and biking an option for connectivity. We applaud and appreciate the work MoDOT, the adjoining cities, counties, Great Rivers Greenway District, and other affected agencies have done to carefully study and assess potential Missouri River crossings between St. Louis and St. Charles Counties over the past four years. The river forms a formidable barrier between two of the highest-population counties in the state--and two counties that have the highest amount of bicycle and pedestrian activity and demand, but very few safe opportunities to cross the river. This bridge--along with others along in the Missouri River valley in eastern Missouri promise to connect the most populous metro area in the state seamlessly to a multi-state trail system that will connect cross-state on both the north and south sides of the Missouri River. Additionally, the Discovery Bridge crossing has the potential to be the easternmost capstone of a trails system that will soon be continuous across Missouri on both the north and south sides of the Missouri River, taking in the Katy Trail, the Rock Island Trail, and many other local and regional trails--a fast-developing trail system of national and international significance. The crossing touches and will positively impact a number of national bicycle tourism routes, including the Lewis and Clark Bicycle Route, the Mississippi River Bicycle Trail, the Great Rivers South Bicycle Route, and the American Discovery Trail. For those reasons, creating safe, accessible Missouri River crossings points between St. Louis and St. Charles County is important to citizens and businesses who live in the neighboring communities and as local, regional, and statewide economic development opportunities. St. Louis’s peer regions across the country and across the globe are making non-motorized river crossings and connectivity a priority. The Discovery Bridge project is of local, regional, statewide, and national importance. For these reasons and others, we strongly support the work and conclusions of the river crossings feasibility study, which identified and prioritized the potential non-motorized crossings in this area. We support the conclusions and recommendations of the study, and urge all parties involved to move forward with these recommendations. 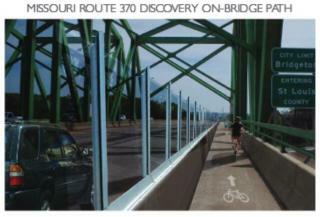 The recommendations include most prominently the conversion of the Discovery Bridge for safe non-motorized use. This is the option that is by far the least expensive, near highest in overall benefit, and most likely to be completed in a reasonable time frame. Our members and other non-motorized users who need to cross the Missouri River in this area have been asking for a safer Missouri River crossing in this area for decades. Time is of the essence. Specifically, we ask MoDOT and the municipalities and agencies working on the Discovery Bridge crossing project to move forward with the project, to work together productively to find solutions to any technical issues that arise, and to move the project forward in a timely manner so that project funding is not endangered. 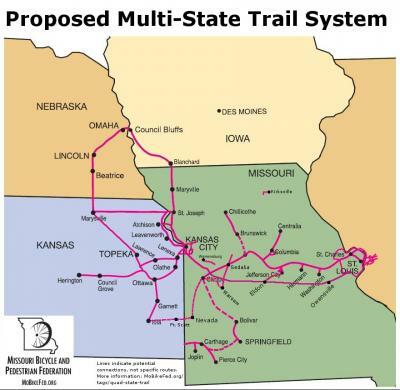 Trailnet and the Missouri Bicycle and Pedestrian Federation feel very strongly that is not acceptable for this project to be cancelled or inordinately delayed. A solution that shifts inappropriate large ongoing costs onto local municipalities is not appropriate or feasible and, for that reason, is also not a reasonable or acceptable solution. We urge and encourage all parties to work together to solve technical issues and find a solution that will improve regional connectivity for non-motorized transportation while remaining within the project budget and timeline. The organizations also support the Blanchette Bridge (I-70) Bicycle and Pedestrian Path project and support progress to accomplish the preliminary design for that vitally important project. This project should be a priority when the eastbound bridge undergoes currently planned major maintenance in the next few years, and funding for the bicycle/pedestrian portion of the project should be prioritized and sought along with funding for the remainder of the project. We very much appreciate MoDOT’s commitment to non-motorized transportation. We know that MoDOT understands the importance of bicycling and walking to a 21st Century economic and to keep Missouri as an attractive and viable environment for tourism, for business, for vibrant and growing communities, and the safety and wellbeing of our citizens. To give Missourians better transportation choices. To recognize the important role that pedestrian and bicycle facilities play for those who cannot or choose not to drive. To expand and improve transit, air, passenger rail, bicycle and pedestrian options throughout the state. We are very encouraged that MoDOT has adopted a forward-looking, 21st Century approach to creating full connectivity for all users of the transportation system, including non-motorized users, and have complete confidence that MoDOT will fully live up to these principles as it moves forward with its partners to complete this Discovery Bridge nonmotorized transportation project. « Previous story: Announcing the 2017 Missouri Active Transportation Summit August 11th in Jefferson City - Join us!